Is the Shark Rotator with DuoClean Technology (NV801/NV803) worth your hard earned money? In this article we take a hard look at the vacuum and analyze its features and performance to answer the question. - We like that the vacuum comes with 4 tools and a tool bag. - It is very easy to steer. The cleaner head moves and changes direction at the twist of a wrist. - The cleaner head is narrow so it can get in and out of tight areas without much trouble. It also has a low profile so it can reach under low furniture. - The vacuum is not too heavy at 14.5 lbs and it is compact. It isn’t as large as many other uprights. - It sports DuoClean Technology (2 brushrolls) and this approach really works well on low/medium pile carpet and bare floors. - The vacuum has good edge cleaning (on the one side). - Maintenance is simple. There are no bags to change (this is a bagless upright), all the filters are washable, and the brushrolls are designed to pop in and out almost effortlessly. - It comes with HEPA level filtration and a sealed system (which ensures all the air is passed through the HEPA filter). - The lift-away feature is a brilliant idea. You can lift away and carry the dust-canister/motor assembly while using the hose/wand/tools with the other hand. It turns your upright into something like a handheld. - The headlights on the cleaner head illuminate dimly lit areas and they are designed to last the lifetime of the vacuum. - It has a 30 foot power cord. - It carries a 7-year limited warranty. - It is a little louder than most of the other Shark upright vacuums we have tested. It also gives off a more high-pitched whine. We don’t find it too loud but it could be an issue for some people. - The narrow cleaner head while great for getting into tight areas is also something of a drawback when you are cleaning larger areas. You have to do many passes of the vacuum as the cleaning path width is rather narrow. - The pet power brush is ok at pulling up pet hair but it gets bogged down quickly and requires frequent cleaning. If a thorough cleaning is necessary (which can be fairly often depending on how much pet hair you are dealing with) the tool has to be popped open and the pet hair removed from the inside. - The hose feels short and when using the hose/wand and tools you can easily pull the vacuum over if you extend your reach too far. - The lift away feature results in the dust canister and motor standing out and away from the handle/wand. 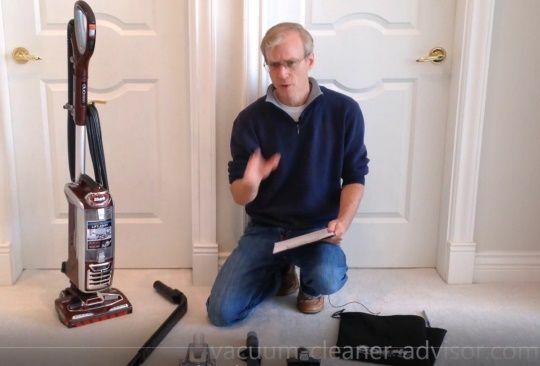 This results in a little more pressure on the wrist when turning the vacuum (see video below). - The vacuum is relatively compact and it therefore has a smallish dust canister. So when doing a lot of cleaning it requires frequent emptying. This vacuum presently retails for $300 to $330. So, is the Shark Rotator with DuoClean Technology (NV801/NV803) worth your hard earned money? If you have low to medium pile carpet and/or bare floors (nothing too delicate as the brushrolls can only be slowed, not fully turned off), limited need for above-floor pet hair removal, a small to medium sized home, then we’d have to say YES. You may wish to read our full detailed Shark NV801 review.